18 year old Moira Murphy reminisces about the day she takes a walk through the field only to arrive on the blood-splattered porch steps of the home of her friend Percy Brown. When she ventures into the house to investigate, she encounters a stranger who will force a new existence upon her - one that is deathly and quiet. Fifteen-year-old Evey Jones is a Leapling — born on the leap day in a leap year. As she approaches her sixteenth birthday, she fills her journal with the strange and deadly things that have happened to her every February 29th, including her encounter with a Shadow, a terrifying creature haunting her dreams since she was a little girl. 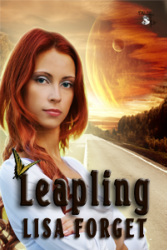 As she faces her fears, Evey finally finds out why she’s been plagued with near-death experiences every Leap Year, and discovers the role she's expected to play when an alien race puts into action their plan for the birth of a whole new world on Earth — that is, if she’ll except her destiny and Adam, the alien prince who comes along with the deal.